Two of our dogs got into a scuffle recently, and the clear loser was whisked away to the vet. After having a flap of skin glued back onto his lower eyelid, we had to keep Alexander from pawing at it; it was time for the dreaded e-collar, aka the cone of shame. This time, instead of using the traditional plastic one the vet always gives us, we wanted to try a soft e-collar (not only to make him more comfortable, but also to ease our overwhelming guilt). 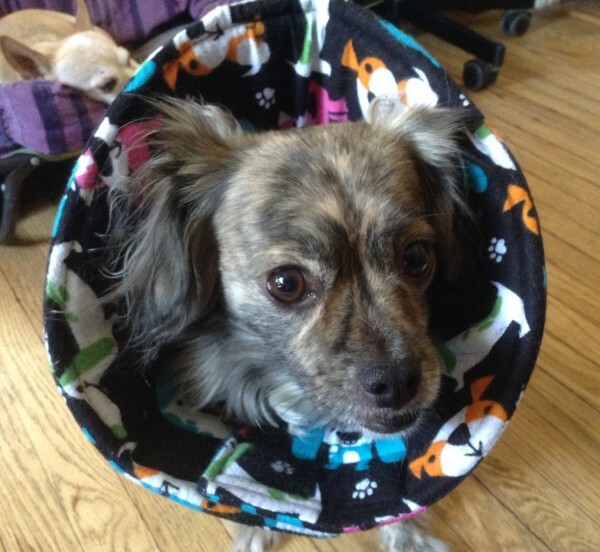 This was our first experience with a soft cone, and we absolutely love the one we got from Loving Embrace Collars. It turns the e-collar experience into a complete non-event. It’s sturdy enough to keep the injured area safe, yet just flexible enough to be comfortable. It attaches to a dog collar with ease, and there are two long strips of velcro for tightening or loosening it around the neck. It’s lightweight, and the covering is flannel, so this soft e-collar offers Alexander the next best thing to resting his head on a bed. The collars come in small through XXL, and you can choose from a variety of cute designs. It’s also machine washable and made in the United States, which we love. 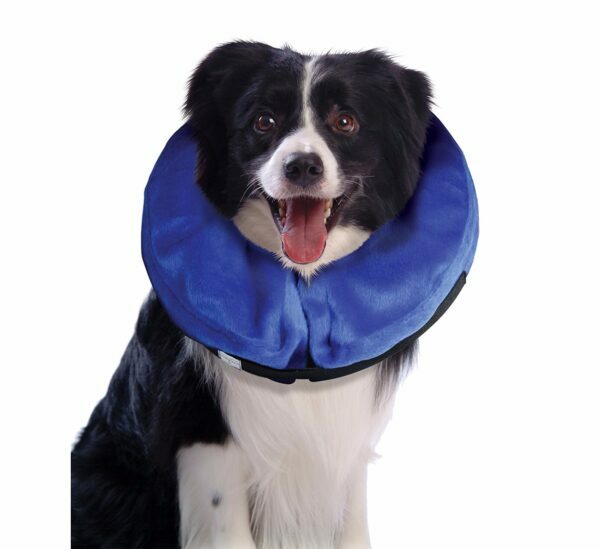 This soft collar comes in dark blue and is available in small through XL. There is a thin, reflective strip along the outside, and it is water resistant. It also has a stainless steel ring for you to connect a leash to (although that doesn’t seem like a very good idea to me). 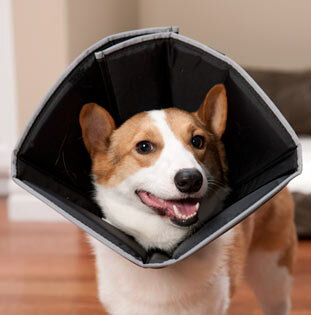 The Comfy Cone is available in seven sizes, and an extender for large-breed dogs is also available. 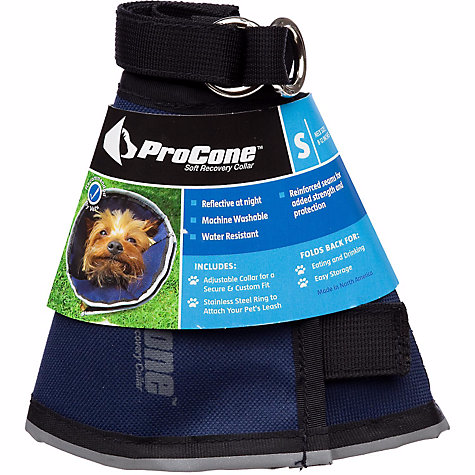 Made of water resistant, nylon fabric, this cone can be wiped clean with water or popped into the washing machine. There are also removable stays on this collar to make it stiffer or more flexible, as needed. This is an inflatable collar, so it’s designed to restrict neck movement. It comes in five sizes and is washable. Since this collar would not necessarily prevent a dog from rubbing or touching his face or head, it’s best suited for keeping your dog from reaching his back end with his mouth. It isn’t a viable option if your pup’s injury is above his neck. 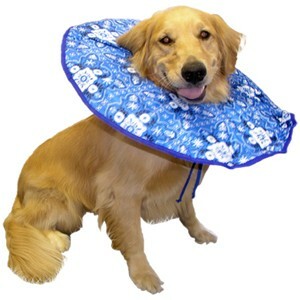 Made from a heavy, waterproof nylon material, this soft collar is shaped more like a disc than a cone. Available in seven sizes, it comes in a blue and white pattern. Honestly, I’m not sure what kind of injury would be better protected by this ring shape opposed to a traditional cone shape. However, the extra width might be beneficial in some instances. So, Dogsters, have you tried any of these soft e-collars or found one you really like? Share in the comments so we can all learn from one another (and ease the cone of shame guilt we all feel!). The post 5 More Alternatives to the Dreaded Cone of Shame appeared first on Dogster.